All of our nets are made of high quality all-weather material, very durable and made to last! 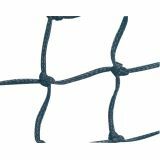 This official size Champion Sports Field Hockey Net is made of 2.5mm braided 1.5" square polyethylene netting. This foldable and collapsible goal is crafted from impact resistant ABS plastic. Custom fittings allow the top and bottom of the goal to fold inward, making storage size only 5" deep! 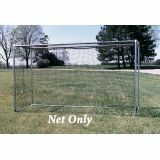 This 54" goal includes an all-weather net & heavy-duty sleeve. 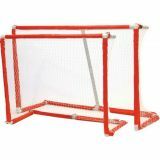 The best and most durable hockey goals available. Lightweight 1-5/16" O.D. galvanized steel with mounted rubber feet to protect gym floor. 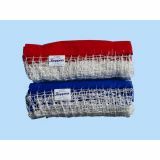 Tough, polyethylene nets are 1-3/4" mesh and have a colorful sleeve-type binding (one red, one blue). 4'H x 6'W x 20"D.
Take your hockey game to the streets with the NEW! 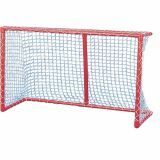 Champion Sports Deluxe Pro Steel Hockey Goal. 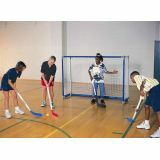 Great for the outdoors and a game of street hockey or indoors for a game of floor hockey, this goal is made of heavy-duty steel with a 5mm weather treated net. Sturdiest and most durable pro goal on the market! 2" 16-gauge heavy-duty galvanized steel frame. Pro-style top, rounded back bar. 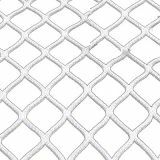 72"W x 48"H x 36"D.
Field Hockey Net, official size 12' x 4' x 7' x4', 2.6, polyethylene net, 1.5" square mesh"
Champion Sports Hockey Goal Replacement Net offers unparalleled durability. 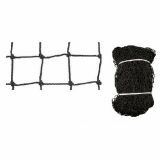 This 4.0 mm knotless polyethylene netting was designed as a replacement net for the SHGPRO & SHG64 goals. 4' x 6. 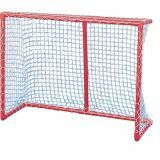 Replacement nets for FHGN-33 goal are 1-3/4" square mesh and constructed of extra durable, twisted polyester. Nets have a colorful sleeve-type binding (one red, one blue). Practice your hockey swing, control, and aim with the new Champion Sports Hockey Training Target. 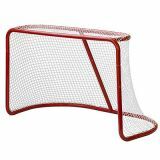 Great for outdoor or indoor practice and training, this hockey target is designed to fit the SHG series goals or any 6' x 4' goals. 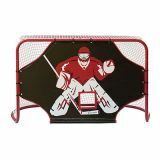 Features Heavy-Duty catcher with goalie image, and double sewn reinforced openings.